Things We Don't Know: How many species are there? Admittedly, some of these problem in figuring out how many species there are, are bookkeeping problems. Taxonomists, who are the professionals who describe new species, often had a very hard time tracking down and compiling all the species names published. If a description of a new species was published in a small regional journal, another researcher could be completely unaware of the work and publish a description of the same species with a different name. Online databases are certainly helping with that, though it's not completely solved by any stretch of the imagination. 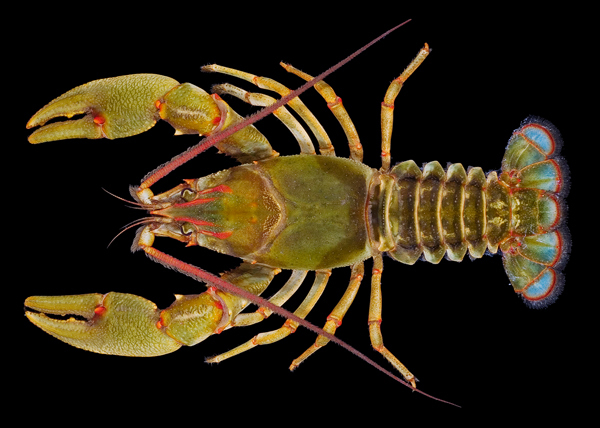 But, as the crayfish example shows, a lot of the uncertainty in how many species there are revolves around just how much might remain to be discovered. The point is: we found a lot of stuff quickly, but then discoveries tapered off. Do we see that slowdown for species discovery? In 2006, a paper by Martin and Davis came out that tried to document the rate of species discovery in crustaceans. Crustaceans are a big group, here's an example of the rate of species description for the decapods, which is the group that includes crayfish, lobsters, and crabs: the animals that most people are familiar with and think of when they think "crustacean." The astonishing thing to me about this graph is that the rate of species discovery shows no signs of slowing down. In fact, you see how their total around the year 2000 is just a hair under 8,000 decapod crustacean species? Less than 10 years later, De Grave and colleagues reckoned that there were almost 15,000 decapod crustacean species. 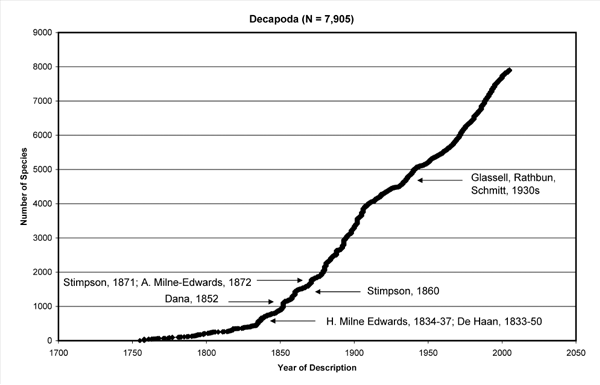 Regardless of whether the differences in numbers are better bookkeeping, improved estimates, or one awful lot of new species described, this suggests we're not even close to finishing the list of decapod species. This probably isn't a general trend. For some groups, like birds and mammals, we probably have slowed down on species discovery. (There are a lot of birdwatchers out there!) But this example shows that there is a lot of work ahead before we narrow down how many species there are. We may never know exactly how many species there are, but we can come much closer to the actual number than we are now. Zen Faulkes is an Associate Professor of biology at The University of Texas-Pan American. He blogs at NeuroDojo and is @DoctorZen on Twitter. De Grave S, Pentcheff ND, Ahyong ST, Chan T-Y, Crandall KA, Dworschak PC, Felder DL, Feldmann RM, Fransen CHJM, Goulding LYD, Lemaitre R, Low MEY, Martin JW, Ng PKL, Schweitzer CE, Tan SH, Tshudy D, Wetzer R. 2009. A classification of living and fossil genera of decapod crustaceans. Raffles Bulletin of Zoology Supplement 21: 1-109. If you're a researcher and would like to write a guest blog for Things We Don't Know get in touch with the team. Just more evidence of how tough this problem is, and how many more discoveries await!